Gaining weight despite eating right? Does your diet consist of olive oil, nuts, lean meat, fruits, and veggies? Do you eat clean all the time but you can’t lose weight? Let me tell you a secret: healthy foods can make you fat. Eating clean is not enough. To burn fat, you must exercise more, eat less, or do a combination of the two. When energy intake is greater than energy expenditure, the surplus will be stored as fat. In order to lose weight, your energy intake (the number of calories consumes) must be lower than your energy expenditure. Let’s start with the food pyramid. It puts emphasis on carbs and assumes that all sugars are equal. When this model was created, over 56% of Americans were overweight. In 2004 – which was 12 years later – more than 65% of U.S. adults were either overweight or obese. The number of overweight people has increased by 9%. 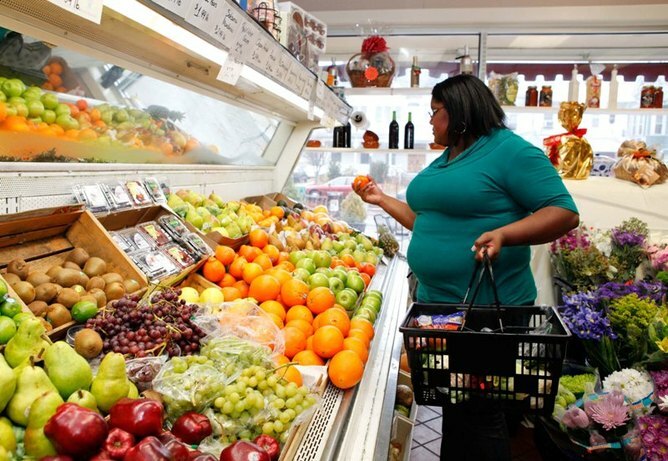 Many of those who followed the Food Pyramid guidelines are now facing weight problems. If you do a quick search online, you’ll see that many users are asking questions like: “Can eating fruit make you fat,” “Can eating nuts make you fat,” “Can eating grapes make you fat,” etc. People are starting to realize that losing weight and keeping it off requires more than healthy eating. Even the highest quality foods can make you fat under certain circumstances. Eating too many carbs, too much protein, or too much fat will eventually cause weight gain. The bottom line is that anyone can become overweight or obese by eating more calories than the body needs. You don’t even have to take those calories from junk food and sweets in order to gain weight. It’s enough to eat too many healthy foods. Exceeding your daily calorie requirements is easier than you think. Let’s say you need 1,200 calories a day to maintain your current weight. If you eat two bananas (200 kcal), 100 grams of almonds (607 kcal), two scrambled eggs (204 Kcal), 150 grams of chicken breast (246), and a glass of orange juice (112 kcal), you already got 1369 calories. Let’s face it – most people eat more than that in one day. The example above consists of healthy foods such as chicken breast, almonds, bananas, eggs, and orange juice. Still, these foods can make you fat. If you don’t calculate your macros, you can easily exceed your nutrient requirements. Just think about how many carbs are in bananas and orange juice alone! Before starting a diet, you need to know exactly how much protein, carbs, and fat are needed for weight loss or muscle building. This depends on a number of factors, including your age, weight, physical condition and more. A nutritionist can help you determine how many calories and macros you need in order to lose weight. Can You Get Fat from Eating Healthy? Many people believe that just because they eat healthy they can have as much food as they want. This is one of the biggest mistakes you can make. Whether you eat fries and chocolate, or fresh salads and fruits, you’ll gain weight unless you watch your portions or increase your activity level to offset the imbalance. Having even a 100% clean diet doesn’t guarantee that you will lose weight. You can be obese and eat nothing but “healthy” food. Let’s use fruits as an example. Most people believe that fruit is a healthy snack that can’t make them fat. The truth is that fruits have lots of easily accessible carbs. When you eat simple carbs, you’re basically telling your body to stop burning fat for energy. Of course, if you go jogging right, do house chores, or start lifting weights soon after eating fruits, you’ll burn some energy. However, the surplus glucose will be converted to fat by the liver and stored as adipose tissue. Fruits are healthy, nutritious, and low in calories. They are a great snack when you’re on the go or need a quick source of energy. If your goal is to lose weight, then you should eat foods rich in complex carbohydrates. The simple sugars in fruit will only replenish liver glycogen stores, while the complex carbs in whole rice and potatoes, will replenish muscle glycogen stores. Anyone can get fat by over-consuming healthy foods. Regardless of their source, excess calories are bad for your health. Balance and moderation are the key to optimal weight.